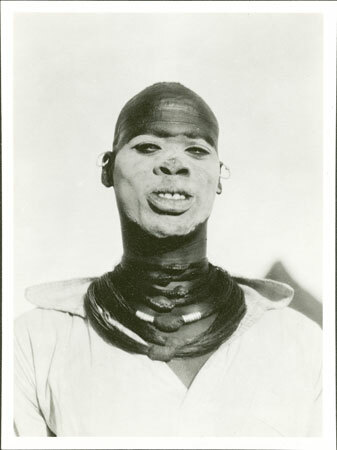 A head and shoulders full face portrait of an initiated male youth (identified as Wie or Wia) wearing a white shirt and numerous elephant-hair neck ornaments, with ash smeared on his face and ritual scarring on forehead and earrings. Evans-Pritchard records a Wia as a son of Cam of Yakwach village on the Sobat River. Evans-Pritchard employed Wia in 1931 during his fieldwork among the Lou at Yakwach, and re-engaged him again for a month-long visit to his father Cam's village of Yakwach in July 1935. After working for Evans-Pritchard in 1931, Wia worked as a groom for F. D. Corfield the District Commissioner at Nasir, where he managed to get together a small herd of cattle at the district headquarters there. Note on print reverse ms pencil - "09 62 XXVIIIb"
Morton, Chris. "Portrait of a Nuer youth" Southern Sudan Project (in development). 03 Jan. 2006. Pitt Rivers Museum. <http://southernsudan.prm.ox.ac.uk/details/1998.346.62.2/>.